If you are just joining in, you can read about the quilt along here and see the original quilt here. PDF patterns are available in my shop and Quilt Kits including fabric, the Tri-Recs tools, and a printed pattern are available at The Intrepid Thread. Everyone is welcome and you can join at any time. 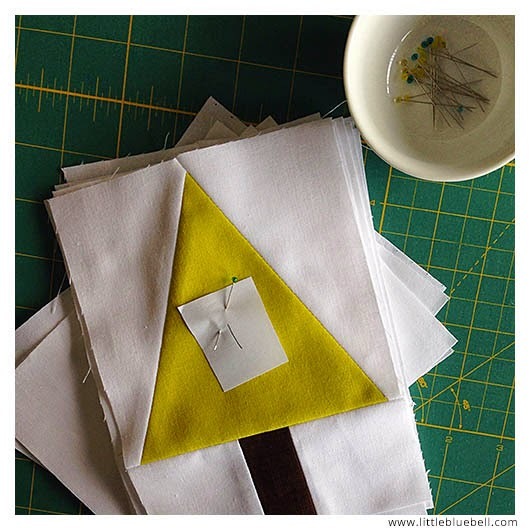 Are you having fun sewing your forests together? It is so awesome seeing everyone working on their projects. 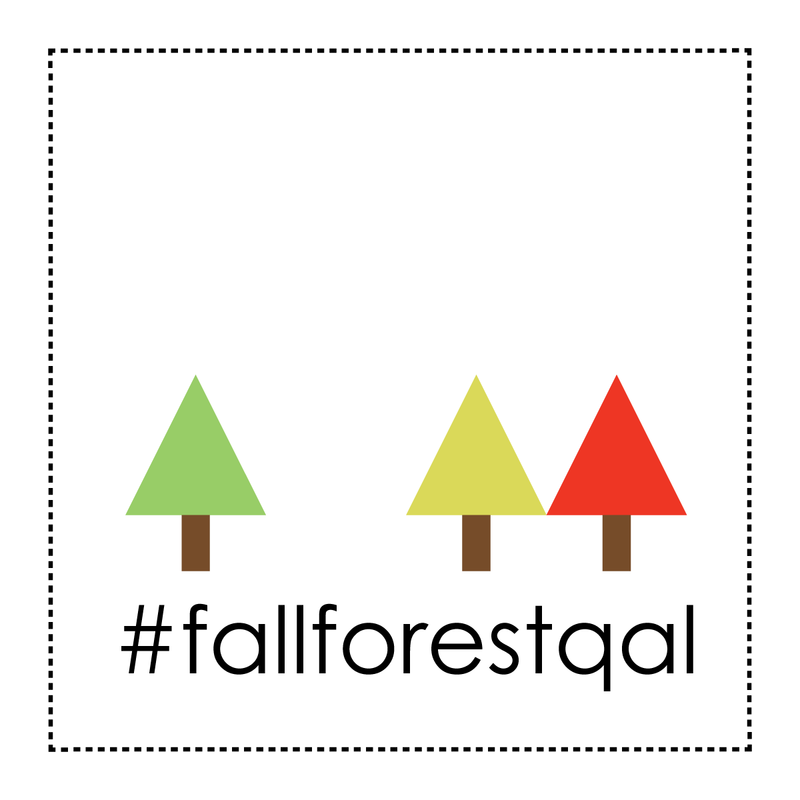 I saw one finished quilt so far on Instagram (#fallforestqal). It was backed in aqua minky and it looked so cuddly and gorgeous! 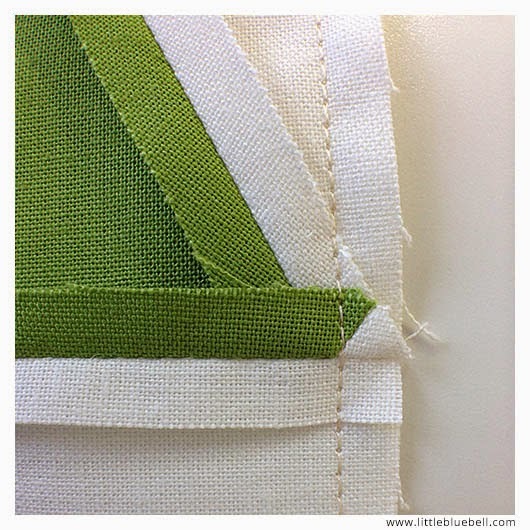 I have a few more tips for you and some process photos of my new winter version of the Fall Forest Quilt. My kids were telling me that if we have a fall forest quilt, and a winter forest quilt, then we also need spring and summer forest quilts. I follow their logic, but oh my goodness that's a lot of trees. A friend recently had a piece of Kona Poppy bleed onto another fabric while she was ironing it for a project. I'm also using Kona Poppy in my quilt, but I've never had an issue with Kona cottons bleeding so I didn't pre-wash my fabric. I got nervous when she told me about her experience. There is a lot of white in this quilt. I tested my piece of Kona Poppy and I looked for any sign of the dye coming off. 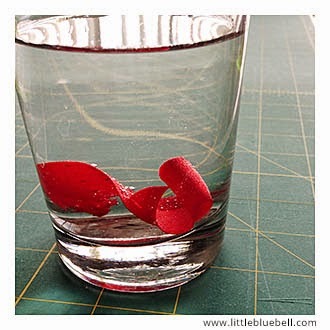 I submerged it in warm water and let it soak, I agitated it with my fingers, let it soak some more and there was no dye in the water. I also ironed the wet red fabric against a scrap of white fabric. Nothing. Then I did it all a second time. I did not have any issues with the color coming off. If you are concerned about dye running and staining your quilt, please take some precautions. Either pre-wash your fabric, or wash your quilts with color catchers, vinegar, synthrapol, or salt. 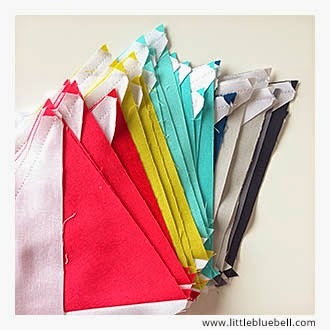 I am not an expert on any of these methods, but I plan on washing my finished quilt with Shout color catchers just to be safe. I'll post the results here on the blog. After sewing one block to make sure everything went smoothly, I set up at my machine with stacks of all my pieces. I sat down and sewed everything together one right after the other without clipping my threads in-between. 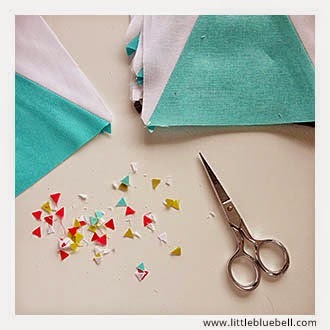 This pattern is perfect for chain piecing because all the trees are the same. It goes by so quickly! You will blink and be done with all of your piecing. My favorite part about this pattern is arranging the trees and colors into pretty clusters. It is completely modular and so easy to make your quilt unique. A design wall (or floor) is really helpful in creating a layout with your blocks. It allows you to take a step back to look at your quilt with a new perspective. Taking a photo also helps your eyes see it in a different way. Are you a planner? Do you like to sketch out your design ahead of time and choose your colors carefully? I do that too so I included a coloring page in the pattern. When it comes time to sew my quilt top together, I carefully gather up the blocks for each row and pin a label on it. The labels don't have to be anything fancy. I usually write numbers on scrap paper and pin it to the first block in each row. I've also used pieces of painters tape with numbers written on it. They both worked fine. Use whatever you have handy. 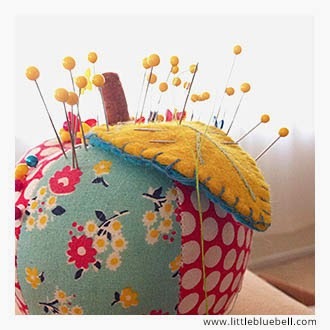 There are so many ways to sew and quilt and everyone finds what works for them. I like it when people share why they do it a certain way because then I feel like we can all learn from each other. Here are a couple of things that I do, especially when working with triangles. Have fun with it and let me know if you have any questions. I will post answers in the comments.